Does Primordial Hydra take priority over Abzan Beastmaster? MontaukMonster - as the person designing the proposed cards, the onus is on you to defend their creation. You are the one opening up your cards for critique, after all. It is not enough to just say "because I can," particularly given the abnormal nature of these proposed cards. You also really need to work on your tone--as has been mentioned already, you're coming off very aggressive, and that's not fair to those who took the time to respond. In the interest of discussion, however, I will offer what you have yet been reluctant to do--a defense of your core concept. Personally, I agree with what others have said--that planeswalkers need to be limited in scope, but I want to move the conversation past the discussion of the core concept so we can address the actual cards themselves. What is the justification for the game design, and the creation of common planeswalkers? As of right now, Pauper does not have access to any planeswalkers. This proposal would give pauper access to additional cards, as well as make planeswalker-matters cards that are currently at uncommon viable options in pauper, expanding the card pool and increasing diversity. What is the lore justification for common planeswalkers? 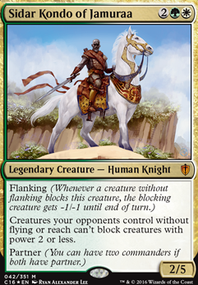 The issue here is that Planeswalkers are, by definition, legendary. After all, only a minuscule number of people have a spark, and only a fraction of those have their spark ignited. The justification here is that someone has figured out how to artificially create the ability to planeswalk (akin to the Planar Bridge or Weatherlight, but embedded in a creature). However, this is a temporary situation, and burns out the person's body (hence why they only have minus abilities). These are just generic individuals who have an artificial spark; they are not great heroes. We've already seen tribal cards, such as instants and enchantments, which show there can be some mix-ups between creature subtypes and others. I think a better option would be to come up with a single planeswalker type that could apply to all of these, and then flavour them through the art. Something like "Planeswalker - Ensparked" that captures the essence of what you're trying to do, without getting into the messy situation of adding creature types. Boza's point is invalid. In addition to Bolas, Ugin, and Karn, there's Ashiok, Tibalt, Kiora, Sorin, Angrath, Dovin Baan, Ajani Goldmane, Ob Nixilis, Mowu (sort of), Nahiri, Vraska, Kaya, Nissa, and so many more. So, that's not really an issue. Contrary to what Funkydiscogod, there is precedent to combine Vampire with another creature type-- Vampiric Dragon , Vampire Hounds , Bloodghast . It's rare, but that's not to say it never happens. I think that covers a lot of the basics, and at least gets us to the point where we can address the individual cards. Pyrenisian Druid - this card is costed too aggressively. It's the same cost as Rampant Growth, for effectively the same effect, but repeatable twice. I think a fair price would be . 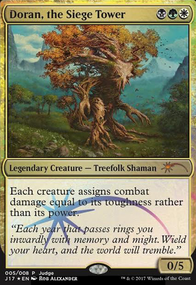 This is the same CMC as Cultivate , accounting for the fact you can get multiple lands, with the additional green added to offset any potential planeswalker synergies, such as proliferate or The Chain Veil . Disciple of Raojan - this is a very powerful effect, as it's basically Shock with rebound. That card already exists in the form of Staggershock , and is costed three. Basing this on Staggershock , I think sounds reasonable. I might also consider reducing this to "target player or planeswalker" to further limit its utility and make it more reasonable as a common. Minion of Jarius] - this is a painful card, particularly against slower decks. However, there is some precedent for repeatable discard Skull Fracture , and Raven's Crime . I might reduce the starting loyalty to two, and change the mana cost to (so far, I think they're all pretty consistent at the 1XX level, provided the loyalties are adjusted accordingly). I would consider bumping this up to , due to the card being at common, depending on the removal situation in the hypothetical set. One, with the potential for three, +1/+1 counters should probably cost more than . Again, I think you can probably get away with , and even keep the loyalty at 3. Norina's Apprentice - five loyalty is way, way too high for this effect. That's a whole lot of cards it could potentially draw. To keep with the theme I have been using, I think 2 or 3 loyalty would be appropriate for that cost. Leaning toward 2 to make this more palatable as a common. 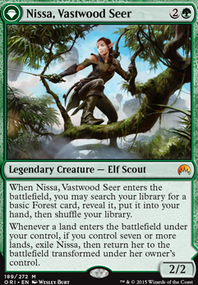 Elvish Mulchkeeper - while Green can draw cards, it's usually in conjuction with lands ( Abundant Growth ), creature power ( Abzan Beastmaster ), or a combat trick ( Aggressive Urge ). 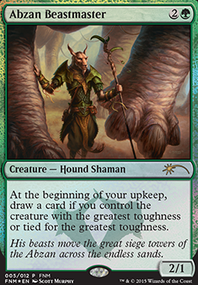 It's a pretty big bend of the colour pie to have this type of card draw on a Green creature. The repeatable shuffling your library is also not ideal--shuffling takes time and is not fun for anyone, and there are enough ways to untap creatures that you could have multiple shuffles in a single turn. That's a nightmare to play with or against. You could probably do something a bit more green. : Reveal the top card of your library. If it is a land you may put it in your hand." Counters are players are a bit annoying to keep track of, but there is precedent for it. White also has the ability to search for basic Plains, so, while it's a bit of a bend, it's on the acceptable side. It's hard to evaluate this card in a vacuum, as I don't know how easy it would be to get service counters. I kind of like the concept, in that it's a decent card at any point in the game. Scaletian Dreadbeast - the proper language is "Spend only mana produces by basic lands to cast Scaletian Dreadbeast." (Source: Imperiosaur I think this might be too aggressively costed and could be either a 4/2 or one mana more, just to avoid a Tarmogoyf situation, but I think you could probably get away with this in a non-standard set. Drow Ascendant - As others mentioned, Regenerate has fallen out of use because it was not an intuitive mechanic (removing the creature from combat does not follow from the word itself; replacement effects trip up players; etc.). This is an extremely problematic card though. Turn 4, Drow Ascendant into a turn 5 Fatal Push for a blood counter, then Damnation with regenerate/indestructible means you can keep this from being wrathed and then swing for a huge amount of damage. I would probably leave it with the firebreathing and ping ability. Gleeful Pyre - Nope. There is no reason for this card to exist. 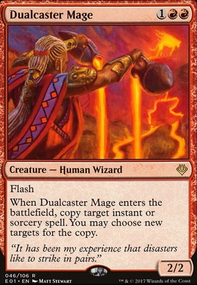 Functionally, it's the same as "You may have four copies of Gleeful Pyre and four copies of Lightning Strike in your deck." There might be some use for it in Standard, but standard usually has enough two mana burn spells floating about that I don't see the first ability as ever being all that relevant. You may look at and play cards exiled with Book of Knowledge. Bloom Tender - fantastic card, it will definitely find a home eventually. Glen Elendra Archmage - I've been trying to remember the name of this card, i want more counterspell in the deck and with it having persist and me running a +1/+1 counter subtheme, it'll be extremely abusable. 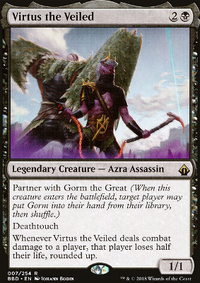 Vorinclex, Voice of Hunger - love this card, but I won't add it to this deck. I run it my mono green deck and I don't want the 2 decks to feel the same. Jin-Gitaxias, Core Auger - I like this card, but it might be a little too oppressive for how I want the deck. It may replace Nezahal, Primal Tide eventually. I'll have to do some playtesting. 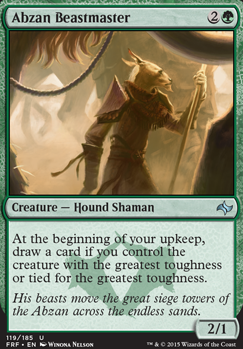 Abzan Beastmaster - this is underwhelming to me. Id rather draw off each creature I cast than banking on getting a card per round. Ixidron - not a fan. I only run 1 morph creature so this would hurt me considerably as I count on all my creature abilities to overpower my opponents. Voyaging Satyr - I personally like mana d9rks more than I like untapping lands. Especially since I don't have any big mana generating ones in the deck. Gaea's Cradle - I have 1 copy , and it's in use in my mono green deck. And I don't switch out cards, so as good as it is, it probably won't find a home in this particular deck. Nykthos, Shrine to Nyx - this is an interesting suggestion, as it's so much better in mono colored decks. But green is my predominant color in this deck and could be decent. I'll have to playtest it and see. I enjoy the idea of your deck but as was stated in the past ramp could be very important for this deck my suggestions for additions would be Vorinclex, Voice of Hunger, he slows your opponents and speeds you up, you are also lacking a bit of draw to refill so some good cards for you to look into with this deck would be Abzan Beastmaster, Drumhunter, Elemental Bond, Garruk's Packleader, Lifecrafter's Bestiary, Rishkar's Expertise, Soul of the Harvest, Triumph of Ferocity you can pick which ones you like. 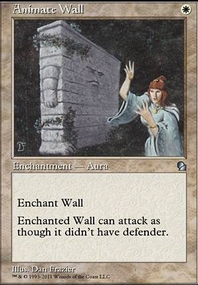 It's worth noting that there aren't currently creature cards with the stated ability (or similar) on them, possibly due to the potential confusion in whether or not that particular creature would also count for the "whenever a creature enters the battlefield" trigger. The closest I could find was Akoum Battlesinger, which has the ability phrased with "Whenever Akoum Battlesinger or another Ally enters" in order to clear up the confusion. In your hypothetical case, though, the creature would enter the battlefield, and then any relevant "enters the battlefield" triggers would trigger unless something else prevents it (such as an effect that causes creatures to lose all abilities). This would include the creature with your hypothetical ability itself, given the wording, and you would draw the card. There is no state where the creature has triggered the ability but is still "entering" instead of "has entered." It enters and the ability triggers, with the creature actually on the battlefield. As for static vs. triggered (vs. activated, while we're at it).... Activated abilities always are phrased "(Cost): (Effect)." Triggered abilities always begin with "When," "Whenever," or "At." All other abilities are static. Llanowar Elves has an activated ability. is the cost, and the effect is adding to your available mana. You pay the cost, and then you get the effect. Abzan Beastmaster and Abzan Ascendancy have triggered abilities with each of the starting words I mentioned. These all trigger when the trigger condition is met (the beginning of your upkeep, when the card enters the battlefield, and when a nontoken creature you control dies). Anything else is a static ability (unless it's a spell). It can be as simple as a keyword like haste or flying, or something wordier like Blood Moon. These take effect as soon as the card enters the appropriate zone, and only stop working when that card leaves the zone or when the card says it ends.